Cocoa has always shown very well. 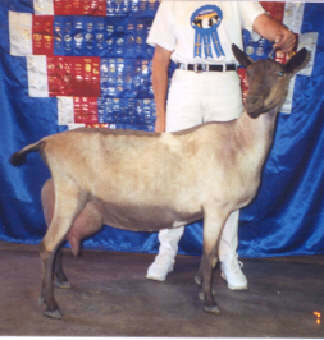 Her mammary has been one of her best assets in the show ring. Cocoa has a long capacious smoothly blending fore udder. Her teats are ideal in size and she is fun to milk. Her medial is very strong. 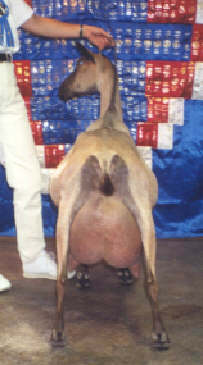 Her rear udder is very capacious and that capacity causes her rear udder to extend further then ideal. Her udder does not blend as smoothly in the rear into the escutcheon as most of my other does, but her escutcheon is very wide. Cocoa’s udder is held up very high and is very well supported. Cocoa is a long tall upstanding feminine doe. She has body and beauty. The milk maid, that being me, is getting older and has not been extending the lactations out to a full 305 days in the last few years. I think Cocoa will to do the work, but I have not. This does affect her milk records.